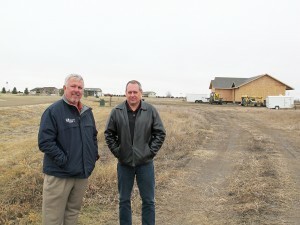 Scott Moore, left of FEM Electric and Mike Nickolas of North Central Farmers Elevator are pictured on a cold December day near the housing development that came to be because of the collaboration among their businesses and Valley Telecommunications. A decade ago, Ipswich, S.D., faced a problem all too common to rural Midwest communities. The Edmunds County seat, population 950, offered many services and conveniences not often found in a town of that size, but without available housing—nor even developed lots—any potential expansion to welcome new residents seemed a distant hope. To alleviate the housing shortage, three local cooperatives combined forces and devised a unique solution. FEM Electric Cooperative in Ipswich; Valley Telecommunications, based in Herreid; and North Central Farmers Elevator in Ipswich formed Rural Dakota Development, LLC, to purchase 40 much-needed acres just west of Ipswich. “FEM felt this would be a good chance to help the community make lots available for housing, which was in demand, while expanding their membership, as the housing development is in their service territory,” FEM General Manager Scott Moore said. Valley Telecommunications had a similar goal. “(We) saw this as an opportunity to help development in a local community and diversify our resources,” Kelly Brandner, marketing manager, said. North Central Farmers Elevator was in need of housing for new and prospective employees at the time, but current general manager Mike Nickolas—who was not a part of the development project—explained that the cooperative had the greater needs of the community at the forefront. “I believe the focus at the time was on benefiting the Ipswich community and not so much … benefiting,” the company, Nickolas said. The formation of the LLC was a natural fit for the three partners. The three individual cooperatives have realized the benefits of the collaborative in their own ways—FEM now is catering to an increased electrical load, and Valley’s internet and rural cable subscribers have increased. And additional housing means more bait to lure prospective employees of all three cooperatives into Ipswich. This translates to benefits to the community farther reaching than property taxes and school enrollment. “Cooperatives are required to return all net margins to their members,” Moore said. The co-ops entered the partnership knowing sale of the lots would take time. “The cooperatives’ housing development plan was to recoup their initial investments and reoccurring cost once all lots were sold,” Moore said, with little to no profit to any of the involved entities even then. Initially, Golf View Acres boasted 28 lots for sale, each lot totaling about one acre. Now, ten years after the project began, the 15- to 20-year sale timeline is on track. Seven homes are completed, and one is under construction. Three additional lots have been sold and are awaiting construction.